Connie Porter, then 50, had just celebrated Christmas with her family in 2016 when she learned she had stage 2a invasive ductal breast cancer. “My sister extended her holiday visit to see some doctors with me, and I was grateful for her support, but then I was on my own for a few appoint­ments until my first surgery,” says the Houston resident. Porter is among a growing number of people who freely give their time and services to help others. More than a third of American adults (an estimated 77 million) volunteered in 2017, 6 percent of them in a health-related field, according to the Corporation for National and Community Service. “Volunteers are our most valuable asset. We wouldn’t exist without them,” says Erin O’Neill, vice president of volunteer engagement and grassroots strategies for the American Cancer Society Cancer Action Network (ACS CAN). Although some people are understandably too trauma­tized after a cancer experience to immerse themselves in that world again, others readily give back to the organiza­tions that provided support through some of their darkest days. This type of altruism does more than positively affect those on the receiving end: The act of doing good makes the volunteers feel better. Various studies show that people who give their time are less prone to feelings of loneliness and depression, perhaps due to the social connections they make while volunteering. Do-gooders also enjoy physical health benefits, such as lower blood pressure and stress levels and even a longer life span. Findings suggest that people with serious or chronic illness who volunteer receive benefits beyond what medical care can offer. In one study, people with chronic pain reported less intense pain and decreased levels of disability and depression when they mentored others. Researchers from Duke University found that heart attack survivors who volunteered felt a greater sense of purpose and were less despondent about their health situation. Organizations appreciate any amount of time a volunteer can offer, but studies indicate that people need to give 100 hours annually (the equivalent of about two hours every week) to reap health benefits. In 2017, Americans devoted nearly 7 billion hours to volunteering, according to a report by the Corporation for National and Community Service. The economic value of that time to organizations is esti­mated at $167 billion. People who give their time are also more likely to give money. About 80 percent of volunteers make monetary donations — nearly double the number of non-volunteers who make charitable contributions. Matt Anthony knows firsthand the importance of philanthropy. In 2003, he organized a 5K run/walk to raise funds for research into glioblastoma (GBM), a brain cancer. The event was the idea of his brother Chris, who had been diagnosed with the disease three years earlier, at age 34, but died a few months before the fundraiser took place. Anthony went on to form the Head for the Cure Foundation (headforthecure.org) and was later honored as one of the CURE® GBM Heroes® in 2017. That year, the nonprofit, which has raised more than $10 million for brain cancer research, held its 100th 5K event. “Thousands of volunteers across the country help make these achieve­ments possible. They’re truly the lifeblood of this founda­tion,” Anthony says. Volunteering can take on many forms, creating oppor­tunities for everyone: raising funds for research, providing one-on-one support, organizing or participating in a fundraiser or lobbying on Capitol Hill. Typically, the only requirements are a positive attitude and a willingness to help. “ACS volunteers tend to be optimistic and passionate about the services they provide,” O’Neill says. In today’s digital age, there are even plenty of ways to make a difference without leaving home, such as providing financial support or campaigning for a cause via phone, text or email. Plus, organizations always need people adept at web-based tasks involving graphic design, online support groups and social media. 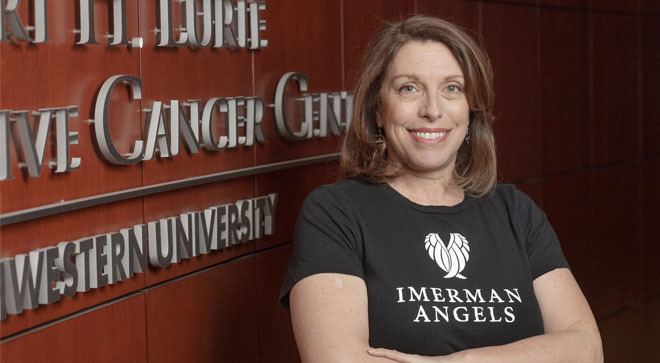 Susan deCordova began volun­teering with Imerman Angels (imermanangels.org) soon after her 19-year-old daughter finished treatment for osteosarcoma, a type of bone cancer. “I help at the office with grant writing, research and administrative tasks,” she says. “I also visit area cancer centers to talk to patients and family members about Imerman Angels.” Founded in 2003 by testicular cancer survivor Jonny Imerman, the Chicago-based, global, peer-to-peer nonprofit organization connects patients, survivors and caregivers affected by cancer with mentors who have experienced similar situations. Her mentor made such an impact that DeCordova decided to give back to the organization and help others, too. Jackie Herigodt says she wishes she’d had someone to talk to when she lost her mother, an aunt and a grandmother to different types of cancer. “I was in my 20s when my mom was diagnosed with stage 4 small cell lung cancer. None of my friends could relate to what I was going through,” Herigodt recalls. “As a caregiver, I often felt forgotten.” Years after losing her loved ones, Herigodt heard about Imerman Angels and became a volunteer. “I didn’t want anyone else to ever feel that alone,” says Herigodt, who is now employed as the organization’s program and outreach manager. She also volunteered for 10 years with the ACS Relay for Life. “For me, giving back to these organizations is a way to honor my loved ones every single day,” she says. Experience and personality come into play when deter­mining whether an individual is mentally and physically ready to volunteer. 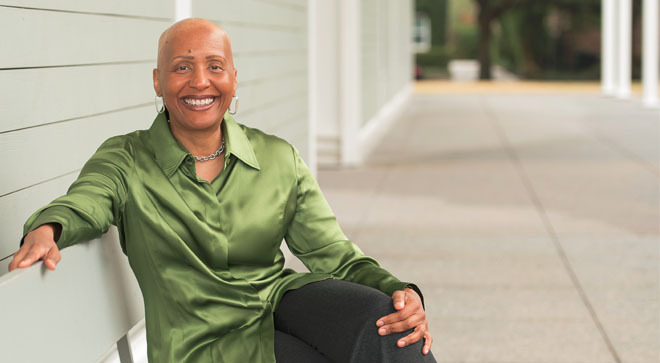 At Cancer Hope Network (cancerho­penetwork.org), a national nonprofit that pairs people affected by cancer with support volunteers, the standard advice is to wait one year after completing treat­ment or caring for a loved one before offering services. “In our 30-plus years of this work, we’ve found it’s helpful to give yourself a little time to adjust to the post-cancer ‘new normal’ before jumping into cancer-focused volunteer work,” says Sarah Miretti Cassidy, the organization’s director of marketing and patient outreach. “We work with each poten­tial volunteer to determine what’s in their best interest.” The organization uses a questionnaire to assess an individual’s mental readiness. This advice isn’t as clear-cut for people with metastatic or chronic cancers, who may remain in treat­ment indefinitely and need to use their best judgment regarding whether they’re mentally and physi­cally able to volunteer. Caregiver SUSAN DECORDOVA, photographed at the Robert H. Lurie Comprehensive Cancer Center at Northwestern University, started volunteering in thanks for the help she’d received from her own mentor.